As a lot of you know, I recently moved to DC so I am experiencing my first real winter in a LONG time. Some people are telling me I am crazy and winter isn’t bad here, but being from Georgia, anything under 60 is COLD. 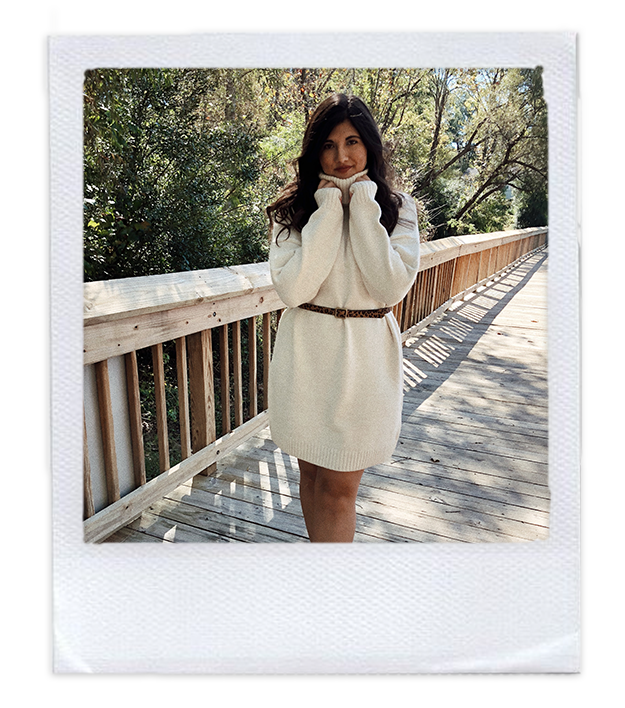 Because of this transition, I am finding a love for sweaters and jackets and learning how to dress in the cold…. (currently on the hunt for a puffer jacket + winter boots). I have owned sweaters in the past but I am now realizing I own a lot of “Georgia” sweaters, aka they are thin and do not keep me warm ughhh. The sweater I am wearing in the picture above is thick and comfy and PERFECT! I have been obsessed with sweater dresses lately, they are cozy and comfy and you can dress them up or down (my favorite kind of fashion). I found this Topshop Sweater Dress at Nordstrom and knew instantly that I needed it! It is SO cozy, it’s not itchy, but size down (runs big IMO). I’ve tried on a lot of sweater dresses and they are usually itchy or too short, but this one is perfect. I have a lot of neutral sweaters in my closet so I think my next purchase is going to be something bold, maybe a hot pink sweater! ?